Burn wrote: At the end of the day, if you consider a movie a good movie, then it's a good movie. If you consider a movie good or bad based on some critics and/or some rating on the internet, then you're a sheep that should probably learn to think for yourself. Don't let others dictate to you what is good or bad, decide for yourself. See, this is what I've been trying to say for years. I hate how systematic everyone's view of a "good movie" is. And I don't get that "guilty pleasure" crap. If you like it, you like it. Quit trying to justify why you like it by putting it in some kind of sub-category that means nothing. But I think the Super Mario Bros. movie is a stupid, very lousy movie, yet I also like it. How do you rationalize my liking a movie I consider to be a bad one? That's an irrational mindset. I can't rationalize an irrationality. I guess it would have to depend on what you like and dislike about it. Specifically. That's how guilty pleasures work, though. They defy our senses of good taste and quality by somehow appealing to us when they normally ought to not have any right to do so. SlyTF1 wrote: That's an irrational mindset. I can't rationalize an irrationality. 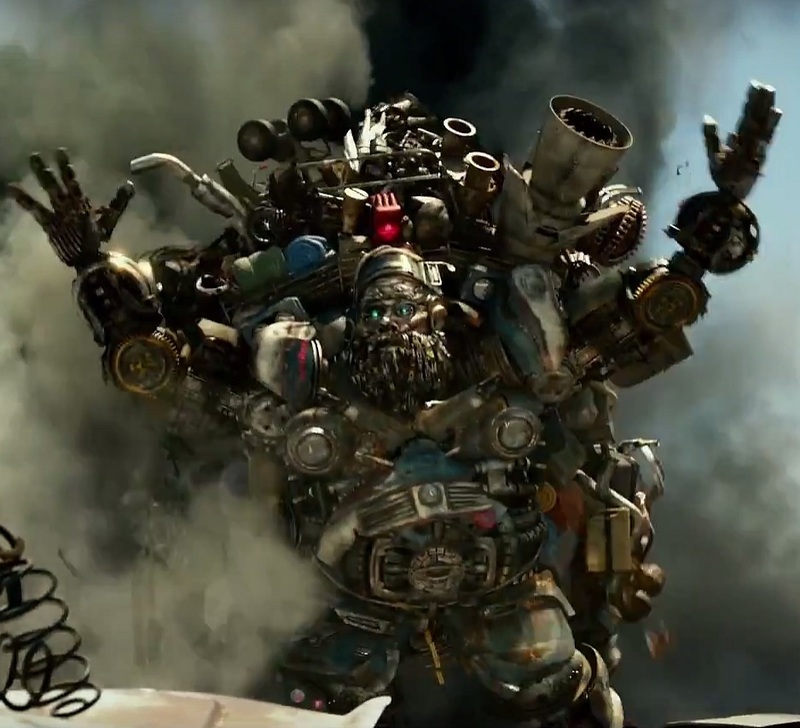 People give a lot of (dis)credit to the director of the live-action Transformers movies, Michael Bay, or to the producers like Lorenzo di Bonaventura, or the writers such as Ehren Kruger or Akiva Goldman's writers room - but what about the editors of the movie itself? Art of the Cut had a chance to talk to some of the six editors working on Transformers: The Last Knight, and discussed the intricacies of working in a team on the same footage, dealing with Bay's own selections and personal style, and their previous experiences feeding into this movie. The full, lengthy piece (which is actually three) can be read here - we've only highlighted some passages below! 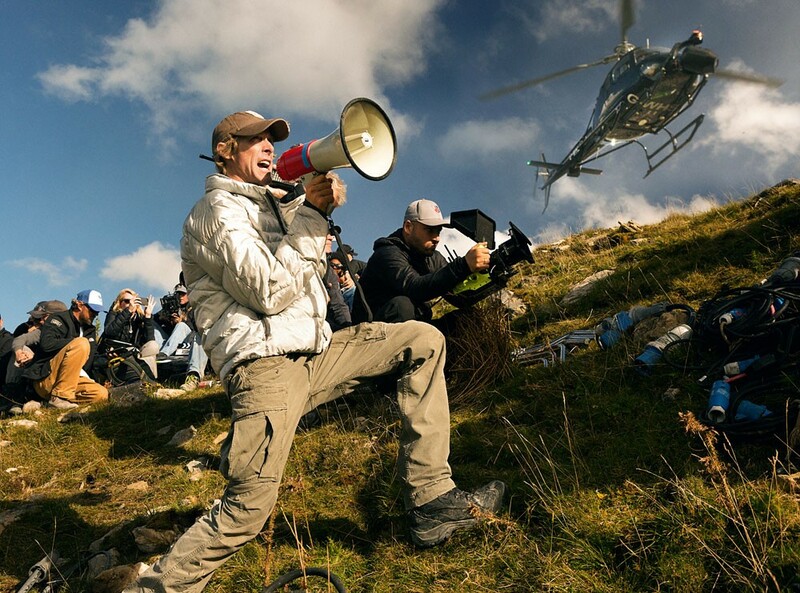 Art of the Cut takes a step into the epic – not just with the film we’re discussing – but because to cover the editing of Michael Bay’s Transformers: The Last Knight, we spoke to four editors in three separate interviews. The exciting thing for readers of Art of the Cut is that when you get six top editors on a single picture, they all learn from each other in ways that are impossible without working on the same footage and with the same director. Those important lessons are at the core of this Art of the Cut. The six editors listed as “editors” are Roger Barton (Pirates of the Caribbean: Dead Men Tell No Tales), Adam Gerstel (Star Trek Into Darkness, Previs editor), Debra Neil-Fisher (The Hangover), John Refoua (Olympus Has Fallen) , Mark Sanger (Gravity), and Calvin Wimmer (13 Hours). We had the opportunity to speak to all of them except Barton and Wimmer. REFOUA: None of us, except Roger, had worked on a movie with so many other editors before, so it took a while for us to figure out how we were going to do this and what does Michael (director, Michael Bay) want? Eventually, you settle into a rhythm and you really have to put your ego on hold because a scene that you work on — Michael, likes to move scenes around from editor to editor. He just wants editors to try different things and eventually he’ll say, “I like that one from this guy…This part from that guy.” So that took a little getting used to. GERSTEL: What was great is after you put a scene together, you get to see somebody else cut the same scene and it really brings to light a different way that you hadn’t thought about. And so the next time you go to cut a scene in the film that may be similar you’re already now thinking of two different way of doing it. It really expanded your view because you’ve seen so many versions of the scenes while also having an intimate knowledge of what footage was there to put them together. You knew what challenges you had when cutting them and you see how somebody else dealt with those same challenges. It’s quite a learning experience. NEIL-FISHER: It was fun actually. It was great to see How each of us approached the material differently. Learning from each other was really awesome. Especially for me. 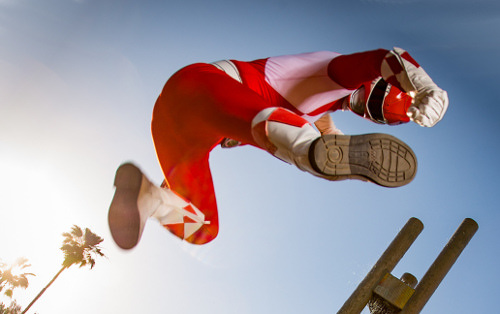 I don’t work as often on action pictures so it was really fun to see everybody’s versions on those scenes. I was fascinated by how many versions you can do of an action scene. How exciting and interesting each one was. And then moving on from here I take that with me and use it on the next thing I’m working on. GERSTEL: Exactly. And this was a complicated story. There’s a lot in there. It has a lot of depth, a lot of layers. And so there was constant conversation about how best to structure it. Michael loved to intercut and he also is not tied to the script so everything is up for grabs and we were always trying new ideas. We would sit, all of us in the room and just talk about what was the best way to put a scene together or put a sequence together. So it wasn’t just always one person taking a stab and then another person taking a stab. There were many times when we were all just discussing it together. Almost like a writers room for editors. SANGER: I like to do it organically depending upon the style of the director. All directors shoot differently so I actively avoid setting myself a particular way of working. That’s part of the fun of going into a new project with a new director: the way they shoot determines how I will assemble. But there is one key area that I won’t change and that’s how I get my assistants to prep the material only up to a certain level. Then beyond that, I will prep it myself because that’s how I learn the dailies. The late and very great Jim Clark always used to mark up his own scripts, rather than use the script supervisor’s version. He would watch the dailies and mark up his own script as he learned them each day. Many of the old school British editors did things that same way. I was only their apprentice at the time but I’m proud to have learned from their wisdom and so what I do is my own version of that. 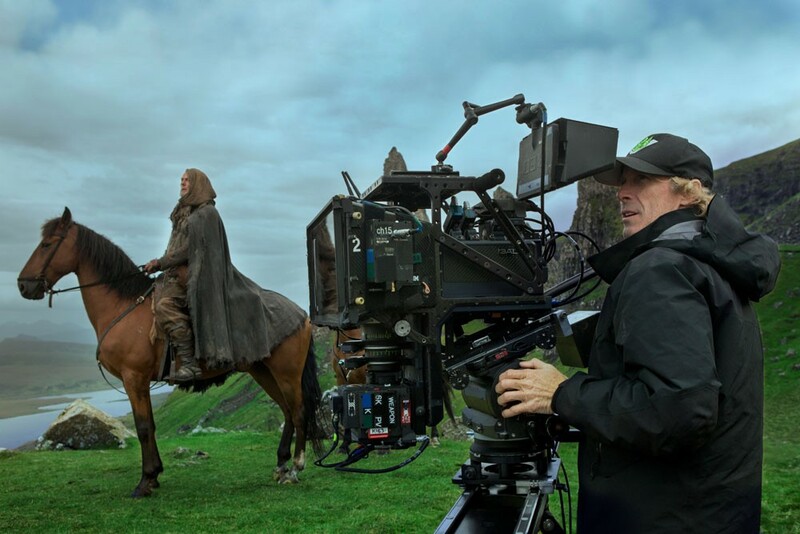 Some directors will shoot very quick takes while others leave the camera running for fifteen minutes at a time. I will adapt how I break down my dailies depending on how the shoot went. 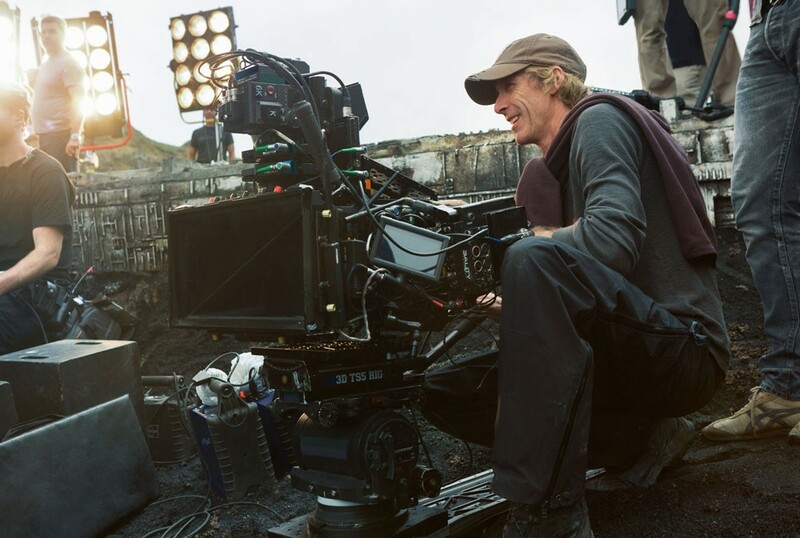 With Michael Bay, you might get 10 hours of dailies for a single scene, and when that comes in you think, “How on earth am I going to get him an assembly by the end of the day?” I decided that 95 percent of my day would be spent assessing and breaking down the dailies. Then, as I was doing it I was developing a mental structure of how I was going to put that scene together. I work fast and make notes as you go. And then at the very last minute, I cut the scene and got it uploaded to him for wrap. You physically can’t go through 10 hours of material and then spent five hours editing. But you can go through 10 hours of material methodically and understand all the dailies and then put together a version at the end of the day that is solid. That’s just what I did, the other editors have their own processes. But we all adapted to Michael’s process and combined it with our own and all were based on necessity due to the volume of material that we receive each day. NEIL-FISHER: I definitely went through each scene looking from a specific point of view. If I was starting the scene fresh, I would look through the film and pulled selects of what I thought were the pieces that would work for me. I went through the dailies and found pieces that were going to aid my version of that scene. HULLFISH: John mentioned that Michael will create his own selects reels. Was it weird using somebody else’s selects? GERSTEL: No not at all. They were just suggestions from him. You didn’t have to take it as final. It was just, “Here’s what Michael pulled as his options.” Often, they were the same thing we would have pulled or a slightly different version. And sometimes we even shared each other’s selects. REFOUA: Gradually the movie, as you put it together, it divides itself into sections. So Michael would say, “I want so and so to make a pass on this section. And I want so and so to try and shorten it and I want so and so to work on this thing that they do or I want somebody to check the jokes and make sure that we have the best jokes.” On Transformers, the editors became a team. We didn’t function as much as individuals but really the teamwork takes over. I had never been in that kind of situation to that extent, so that was cool and sometimes Michael would want three different versions of the same scene. SANGER: He’ll look at scenes individually for a long time and then he might look at scenes assembled with a couple other scenes around them. But then we’ll start looking at things in reels. Instead of looking at those scenes within the reels for three or four weeks or four or five months in advance there’ll come a point where he’s happy with individual scenes then you’ll watch them in reels and when he’s happy with the reels, then you watch them in the movie. And so you kind of go in these much larger steps than many directors who would work on a scene by scene basis and then a reel by reel basis MUCH earlier on in the process. Michael works on a scene by scene basis for much longer and then makes these big leaps where we’re often watching the whole movie maybe on a Monday, Wednesday, and Friday. The changes that are going on within those five days are huge because with five editors you can get quite a lot happening in that amount of time. But it’s piece-meal for much longer at the beginning. HULLFISH: That’s got the potential to just be a political nightmare but I’m glad that it worked out for you guys. REFOUA: Really you have to put the politics away because you’re making a Michael Bay movie. You’re not making a John Refoua movie. HULLFISH: That’s the quote of the day right there. Even the batsheetcrazy Chinese who love TF to death couldn't save this piece o' turd that is masquerading as a story! Even the rushed job full o' error G1 Sunbow shows had more story consistency than this high caloric but low brain disaster! 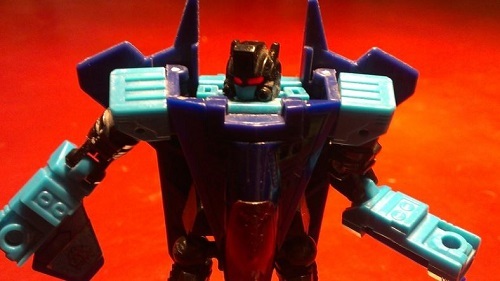 Crossing fingers this won't rub off the entire toy franchise or else it will be the early 90s again when TF went into oblivion! Motto: "If my first sacrifice wasn't enough, maybe you would prefer to pay with your funky blood." Finally saw TLK a second time, and I actually liked it more. Not as much as AOE, but there are still glaring issues. My biggest problem is still Optimus's "arc." I hate it. That's where the movie falls apart for me. I also still dislike how the second act was mostly exposition, even though I was never really bored. SlyTF1 wrote: Finally saw TLK a second time, and I actually liked it more. Not as much as AOE, but there are still glaring issues. My biggest problem is still Optimus's "arc." I hate it. That's where the movie falls apart for me. I'm honestly finding it more sad that I just don't care. This franchise is literally my favorite thing on the planet, and I couldn't give a damn less that it's hurting right now. I haven't even seen the movie a second time. I watched AOE a whole 7 times in theaters, but I have no desire to see TLK again. They should have delivered on what they promised the first damn time. I kinda just jumped to a random page to see what the conversation still was, and I saw this, and I have to admit that I've found myself wondering about the writer's room as well. It's just another installment of "We're going really make the next movie work, guys" that went nowhere. If it took a room of people to come up with the writing for TLK, I'd like to know what happened to the work they produced, because this movie was the same random jumble that the previous four were. I'm not here to be argumentative or anything, but there's no way it took several competent writers to turn out TLK. And, if it did somehow, I'd hope those writers were relieved of their duties, as they clearly failed in their objectives. i AM glad its doing so well at the cinema. mainly because IMO its the best film since the first and im disgusted at the pile on by so called "professional critics" who've been flaming it from day one. its obvious to everyone they were more intrested in trying to kill this franchise than do their job. I know this is a well wornout argument, but they aren't not "professional" critics because they don't like a movie that other people do. And, there have been four prior entries in the franchise; how much more would they have to see before they could feel they've made up their minds in terms of how they view the newest movie? Nothing really changes from movie to movie, so it's not exactly like watching each new chapter is a completely fresh experience. I get it from the fan perspective: the critics don't know anything because they disagree with me. But that doesn't really hold any water. I've got a sneaking suspicion the "writer's room" was simply hyperbole and giving heavier focus to something that most movies have. Making something basic sound like it's something unique and new to make it sound like they're fixing a lot of the plot and character related problems a lot of people had with the movies. Course, I've no idea if that's actually true; but considering what a lot of people are saying about TLK's plot - not just that it's a random jumble but it still is basically the same movie as the last lot - I don't think I'm terribly far off. That the talk of a writer's room wasn't a lie, just a wild exaggeration. Keep in mind that this "writer's room" was helmed by the guy who wrote Batman and Robin, so... did you really have any expectations? Well hey, at the very least, it could have been hilariously bad. Where's Prime's Optimus Credit Card? I didn't expect anything. I have seen the other four Transformers movies, after all. But I agree with Kurona's previous post. I think that the writer's room was mainly to try and sell the 'cinematic universe' idea, like it was just a smokescreen to suggest the idea of something grand and unified. At the very least, the writers' room gave us one scene in this movie that was both legitimately awesome and amusing: The King Arthur vs. the Saxons battle, featuring Merlin the Drunk. Sabrblade wrote: At the very least, the writers' room gave us one scene in this movie that was both legitimately awesome and amusing: The King Arthur vs. the Saxons battle, featuring Merlin the Drunk. But seriously, that being the first scene got me ready for the horrid movie that it was where the director had no sense of tone. So Wesley Burt who has done Concept art for the movie before such as AOE has posted some images of an early concept of Canopy who in here seems to originally turn into some trains. Obviously Canopy became the long haul reuse since well you know but I personally like both. Do you think God stays in heaven because he too, lives in fear of what he's created? 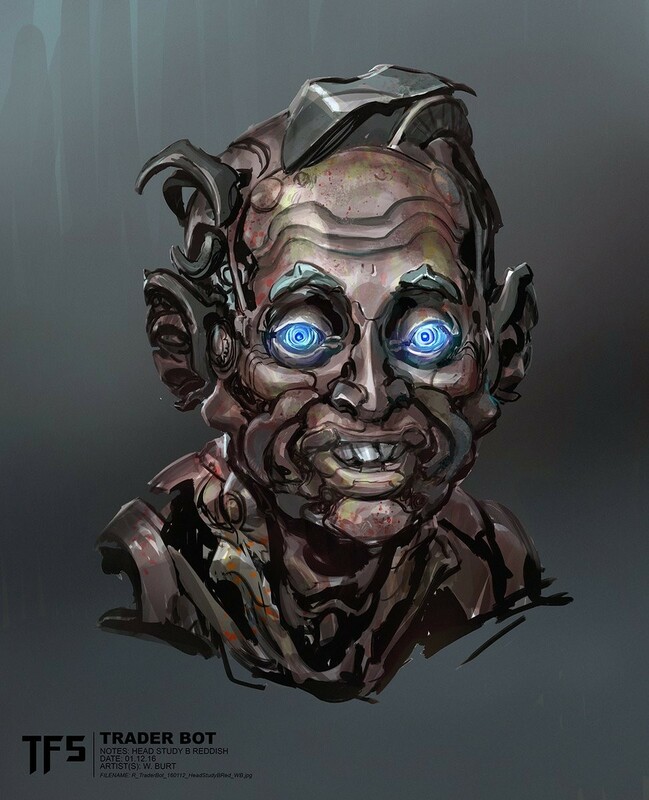 This is Daytrader aka Steve Buscemi before they threw a beard on this face, gave him a hat and called it a day no seriously look closely to this show of him from a spot and the face shares the base design as this one. Why waste time and money to render a decent new form for a guy that will be killed in one of first few minutes? At least they admitted that first four movies were just a series of summer blockusters, not a cinematic universe, it dosen't make plot holes any less offensive, but at least they are honest with us. Just not sure If I like that they will try sell the same thing again and again with "hey, look, it's a shared cinematic universe!". 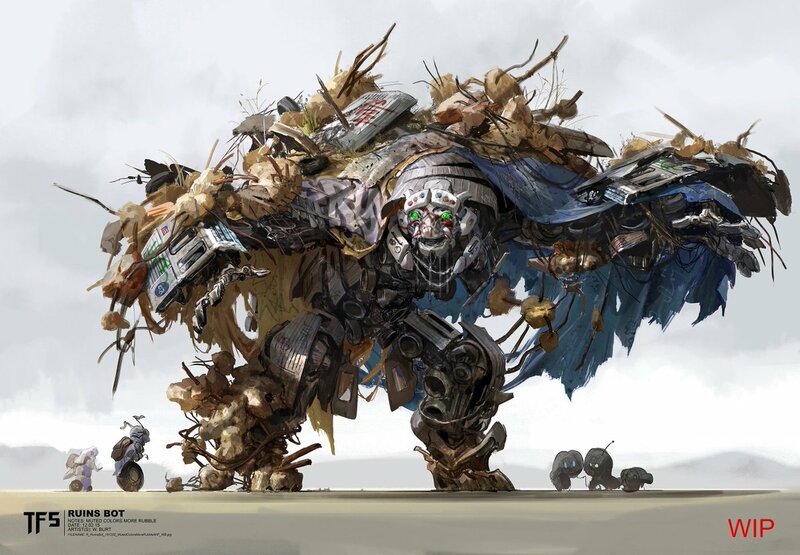 Thanks to our very own Deadput we have some concept art from Transformers: The Last Knight. These images show us how the artist Wesley Burt drew up Canopy and Daytrader ("Traderbot" as he is called in the image notes). On his Instagram page he talks about Canopy's design. 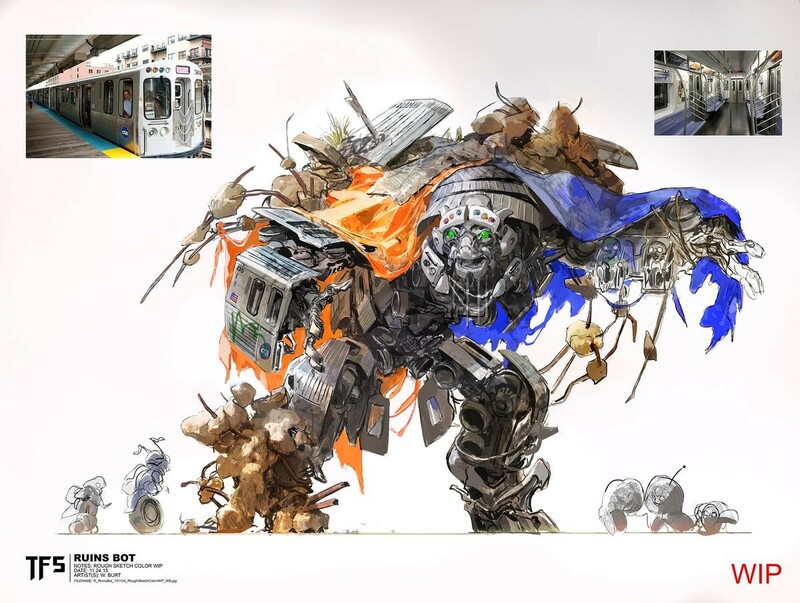 Initial visual development for the Canopy character in Transformers: The Last Knight, based on a Chicago L rail car. He hides all the little bots from drone surveillance with his ruins ghillie suit. In the images below we can see how his design for the character model progressed. Some of the colors darkened as the drawing was finished. What do you think of these designs? 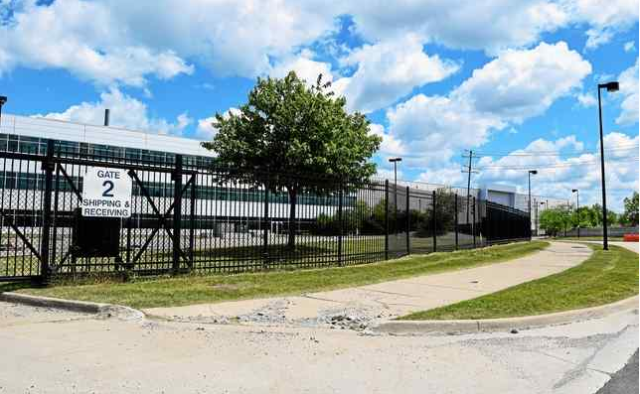 Michigan Motion Picture Studios is going to hold a two day garage sale. Both Transformers: Age of Extinction and Transformers: The Last Knight were filmed at this studio. According to the article there are lots of different items for sale but sadly there are no images. All kinds of treasures could be lurking. If anyone has any images or other information, we would love to know! 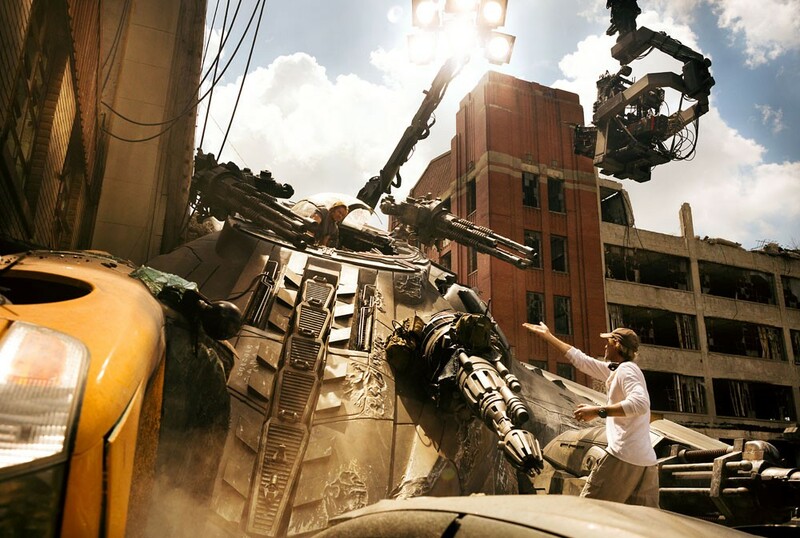 If you would like to learn more about where Transformers: The Last Knight was filmed, have a look at this article. Tables, dressers, couches, costumes, cups, dishes and silverware are just some of the hundreds of items that will be available at the cash-only sale, which will take place from 10 a.m. to 4 p.m. on Friday, July 14 and Saturday, July 15 at Gate 2 of the studio, located at 1999 Centerpoint Parkway in Pontiac. Just in case people missed my post about it above since some people only look at the news post and not the thread. "Do you think God stays in heaven because he too, lives in fear of what he's created?" Canopy reminds me of one of the creatures from The Dark Crystal. Deadput wrote: So Wesley Burt who has done Concept art for the movie before such as AOE has posted some images of an early concept of Canopy who in here seems to originally turn into some trains. Yeah, the animation style of the movie wouldn't/doesn't work well with traditional unbroken shapes and panels.